When the streets of New Lenton were first laid out in the nineteenth and early twentieth century, the builders saw fit to include a liberal supply of small shops in amongst the houses. By the time of the First World War, over a hundred shops were open for business here, almost half of them concentrated on Willoughby Street itself. To this total could be added the premises of jobbing builders, joiners, plumbers, coal dealers, chimney sweeps, launderers and dressmakers. Between them, these shops could supply practically all the food, clothing, medicines and household requisites the Lenton resident might want. Many who lived in the Willoughby Street area were desperately poor and almost all their money was spent in the immediate area, often in the shops that gave credit with the chance to settle up on payday. A shopping trip into Nottingham was almost unknown for some and still something rather special for others. Such was the shopping scene of New Lenton until the Second World War. Afterwards with the slow increase of affluence, shopping in the city centre became much more common. By the time the area around Willoughby Street was redeveloped in the 1960s, many of the shops had gone into decline and quite a number closed down completely. With the 60s came the additional problem for local shopkeepers of the emerging supermarkets. 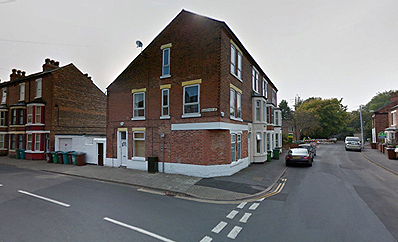 Most of the shops on Lenton's main thoroughfares have continued to hold their own, but those hidden away from view on the side streets have had a much harder time. Many have disappeared, but one that remains is the subject of this feature. Standing defiantly amidst the general destruction of the Castle Boulevard area is Len's Store on the corner of Grove Road and Alderney Street, a general corner shop and off license, which has survived the Council's plans for redevelopment of the area. A survival, however, which has not been achieved without hardship. When Len Jackson bought the property some twelve years ago, the shop was surrounded by people and houses, but over the past four years especially, the population of the immediate neighbourhood has declined dramatically. Many houses have been demolished; others have been vacated only to lie empty for months. Len has found this heart-breaking, but he is, as he describes himself, a fighter, and has continued to keep his store open against the odds. When the first clearance proposals for the area were announced, Len avidly attended public meetings called to hear and discuss the Council's plans. But when those plans were changed and other proposals put forward, Len quickly became disillusioned. He found his property was to be retained, but most of the housing around it was to come down. Various planning applications and proposals have been submitted for the area, and rumours have abounded, but Len has learnt to take them all with a pinch of salt. Too many have come and gone without result. But the latest plans may well give him real grounds for hope. Initially the area was designated primarily for development as a light industrial estate. But now that the market for industrial premises has fallen away, the huge Steada-Raywarp factory has been demolished and the area looks as though it will become the newest of Lenton's housing estates. If and when such plans come to fruition, Len's Store will be at the centre of this new housing and his business should improve dramatically. However, he must continue to face the challenge, common to all our local shopkeepers of the national supermarkets and larger stores, in Len's case most obviously Lipton's supermarket, only yards away on Sherwin Road. Len's trade is mainly that of regular local customers who buy cigarettes, groceries and general household commodities on a small scale. To meet the challenge of those supermarkets Len has kept his prices competitive and the shop open for very long hours. This way he captures as much trade as possible and serves the public during hours that larger retailers would regard as unsociable and uneconomic. Len's situation is far from unique, and is shared by small shopkeepers throughout Britain. But he has survived against opposition others would have given in to long ago. It is all too easy for us to take such local shops for granted. We assume that they will always be open and willing to serve us with the odd article we discover we need late at night. But without the regular support of the local community, the very existence of such shops is put into jeopardy and with the closure of each shop, we lose not only a convenient and useful facility but an important cog in the social makeup of the neighbourhood. The first mention of the shop in the City Directories comes in 1905 when Mrs. Harriet Maltby appears at No. 35 as a fish fryer. But it didn't remain a fish and chip shop for long, as in 1907 a Frank Bird had converted it into the corner grocery that it has largely remained. He sold out to Arthur Bostock and his wife after about three years and although Mr. Bostock died some time in the late twenties, Rebecca, his wife, kept the shop on until the mid-thirties. A certain Ernest Coleman had it for a short while and then Wilfred and Lillian Clarke took it over. Previous shopkeepers had only stocked a small range of foods but when the Clarkes moved in they filled the shelves with new lines and also put out fresh fruit and vegetables for sale. 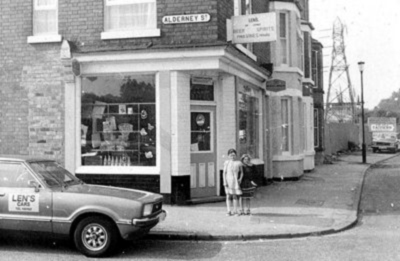 When Mr. Clarke died in about 1950, Mrs. Clarke carried on with the shop until the late 60s when she retired from business and sold the shop to Len Jackson. The shop was then one-third its present size, but Len used his previous experience in the building trade to extend and renovate the property. He also improved the shop's range of 'foodstuffs' when he obtained a liquor license in the early 70s. At present he keeps the shop open from about 8 a.m. until 10.30 at night all through the week. Footnote - Len's Store closed in the late 1990s and the ground floor has since been changed to residential use.